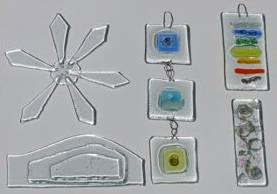 The first thing Barbara did with us was ask us to cut up some plane glass and make a simple pattern based arrangement. 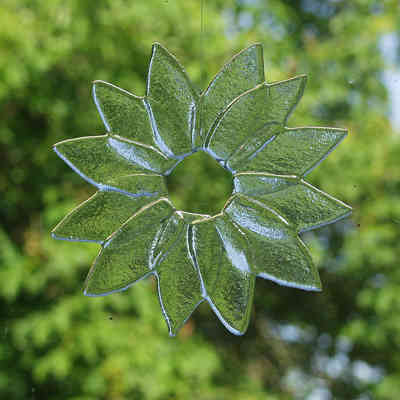 The star left and the flower at the very bottom are examples of this simple shape based fusing. Cathy’s flower is a particularly fine example which required careful cutting and patience to assemble. As the kiln was quite some distance from the studio we were working in the work had to be transported by car and this required the glass to be glued together. Gluing glass is an interesting process as it traps a thick fluid between two surfaces that are impervious and so the glue goes off very slowly. Inevitably this resulted in the odd bit of work being ”rearranged“ in my case one particular piece was redone three time before it stayed in the right position when I tried to move it, clumsy me. The scale of the dangly to the left is not clear from the photograph, each of the little green beads is less then 3mm across. So the piece is about 10mm wide and 40mm long. Green is one the colour I never seem to think to use and yet I love to see it. The piece with the heart started off as a bent bit of wire and a question from Cathy. “What do I do with this?” The simple suggestion to surround it with some coloured glass came in response and because wire cannot be fused to the surface but must be trapped, two layers of clear glass and a really nice wall plaque or window dangler is the result. To give you an idea of the scale this is about 60mm across, so much bigger. When fused the glass takes up a surface texture from whatever it is placed upon in the kiln. This texture does not show up in the photographs but it can add an extra interesting dimension to a piece as the light will reflect of the rear surface. Another, interesting feature of fused glass, especially where multiple layers are fused is bubbles. They are very difficult to predict or control but they do add interest to piece. The wall hanging to the left here is made from four separate squares of fused glass. 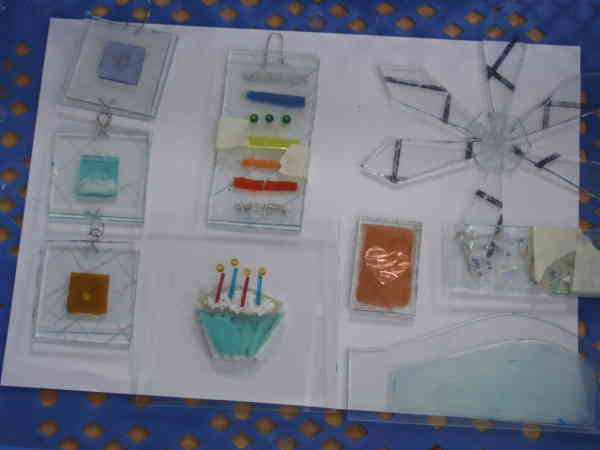 Each is attached to the next by a small wire which is fused between the two outer layers of glass. 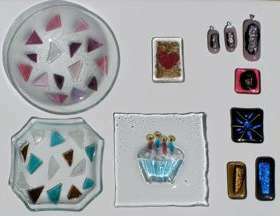 The coloured pattern is made by laying and layering small pieces of glass or other objects between the two outer layers. Various glasses and small pieces of metal work very well between the glass layers. However, care has to be taken as the metal surface will oxidise and therefore change colour in the kiln. Even some glasses change colour when fused depending upon the material that has been used to colour the glass. Finally, Cathy’s clear glass flower hanging in front of a window, wonderful! Below is a picture of some of Cath‘s work before it was fired and the magic happens. All material on this site is copyright and cannot be reproduced without consent.